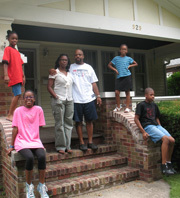 The Gilbert family on their old porch. In the 1970s, the government funded a desegregation plan to move more than 3,500 black families from Chicago to the suburbs. One of those early pioneers was Valencia Morris. She moved to a suburb called Woodridge with her three daughters. Laurie Stern of American RadioWorks picks up the story of one of those daughters 32 years later. Jamillah Gilbert lived in Chicago's Altgeld Gardens housing projects when she was a little girl. She went to kindergarten at a neighborhood school. "I know that the school I went to had water bugs," she remembers. "It was just roaches all through the classrooms. And there was no air conditioning. Some windows were busted out and never replaced. I knew that other schools on TV were not like this school." In 1976, Chicago's new desegregation plan helped Jamillah's mother out of the projects. The family moved 20 miles west to the suburb of Woodridge. For Jamillah and her two sisters, it was a different world. "Grass, trees, nicely paved roads, cut and manicured lawns," Jamillah remembers, laughing. "It was like stuff I saw on TV but I'd never seen it with my own eyes. And I just remember looking around, thinking, 'Where am I?" Jamillah remembers one biracial girl her age, but everyone else was white. "Kids stared and I stared, too. We were looking at each other. But children are just forgiving and they are embracing, you know? It was the teachers that� It was very difficult to walk down hall because the teachers would move their line of students away." "When they arrived in Woodridge, they found themselves in a strange, white world with few prospects. They worked the world for all it was worth." Valencia Morris is Jamillah's mother. "Valencia Morris went back to school, got a nursing degree, and got off welfare," Safer continued. "I was embarrassed when I would go to the store with food stamps," Morris said in the segment, "and everyone around me either whipped out checks or cash." "I remember thinking, "Mo-o-m!" Jamillah says. "You know, 'Mom!' I wasn't angry with her for bringing us out there; I was just angry that once we're out there, it's hard as a kid to see why you just don't have what others have. " Valencia Morris worked two jobs while she got her nursing degree. By the time the older girls were in third and fourth grade, they were getting themselves off to school and watching their little sister. Their mother was gone a lot, but Jamillah says Valencia Morris helped her daughters become strong, self-confident - and proud to be black. Paul, in second grade, told me I was ugly and my skin was black and ugly. "Am I ugly?" And the next day my mother was telling me how beautiful I am and I knew that she was beautiful and I looked like her. So - I am beautiful. And after that, couldn't nobody tell me I wasn't beautiful 'cause I already knew it. My mom would tell us, "You are intelligent - you are the smartest children in that school. Did you know that?" If we did cheerleading, we were the best cheerleaders [chuckles]. Whatever we did. You know, if we wrote, we were the best at writing. I guess it might sound like she was giving us--or building us up with the big head, but she was completely counter-attacking all of the lies that we were being told outside of the house. And then as we grew into high school students and teenagers and started to realize that, no, we were not necessarily the best� but by that time, we had overcome that fragile age. Jamillah's mother became a nurse. All three daughters earned college scholarships and went on to professional careers. Jamillah and her husband Mark are teachers. They live in an integrated neighborhood in Bloomington, Ill.
At dinner time, everyone helps set the table. The girls are singing the Queen song "We Are the Champions." The dining room is a bit cramped for six people. The Gilberts have lived in this small, creaky two-bedroom for 12 years. The three girls share a room and Mark Jr. sleeps on a mattress in the upstairs hallway. Mark and Jamillah have been saving for a bigger house. "Honey, could we talk through the second house again?" Jamillah asks over dinner. "We can talk, but right now I'm about get down to some serious eating," Mark says. "Yes, you'll eat and I can talk, because I know you don't like to talk and eat," Jamillah says. Nine-year-old Nia says she has an opinion too. "What did you like about the first house?" asks her mother. That was last summer. This week the family had big news. They closed on a house last month. Nia is over the moon. "We need to paint a few more rooms, she says, "but we're going to move in next week - next week!" The Gilberts found what Jamillah calls the answer to her prayers in a tree-lined, middle class neighborhood. It has five bedrooms and three bathrooms. "I don't think we're going to have to clean it because I'm going to make everyone keep tidy," Nia says. Jamillah says it's important that her children know about the time she spent in the projects. She wants them to appreciate the struggle, and how far this family has come. "One great goal I have in life is that my children don't have to replicate the struggle, Jamillah says. "It truly is a testimony of growth in our family - we're still rooted, but continually growing higher." This weekend, after saving for 12 years, the family is moving again. Jamillah says her life story proves that place does matter. This story is part of The Real Face of Poverty, an American RadioWorks series supported in part by the Northwest Area Foundation.